The RX stays true to the progressive values embedded in its DNA, while anticipating and meeting the changing needs of an active lifestyle. 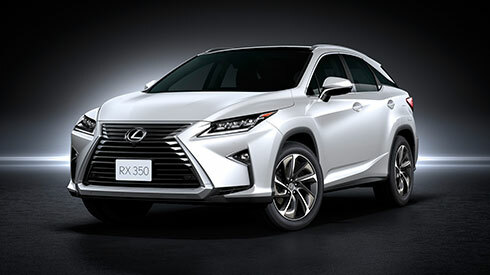 Creating a fresh definition of ‘Progressive Luxury’ began with the RX’s core dimensions, extending the wheelbase to create a strong platform for the outstanding stability at the heart of exciting sporty performance. At the same time, it enables the luxury of a spacious cabin in which to shape fresh design innovations and seamlessly integrate advanced technologies that actively enhance the driving experience. The RX’s design concept of ‘seductive strength’ fuses the powerful essence of an SUV with intelligent seductiveness to take the evolution of RX DNA to a higher level. The V6 Atkinson Cycle engine with Dual VVT-iW generates exhilarating driving performance balanced by excellent fuel efficiency. The futuristic design of the distinctive 3-eye, energy-efficient L-shaped LED lamps with integrated LED DRL creates a signature Lexus arrowhead-shaped illumination. The system actively controls the front and rear suspension in various driving conditions, reducing roll to maintain stability while cornering, and enhance ride comfort.